Shanghai - Chinese Premier Wen Jiabao pledged that China would further reform its currency controls and take steps to resolve problems ranging from the nation's growing trade surplus to its soaring foreign exchange reserves. 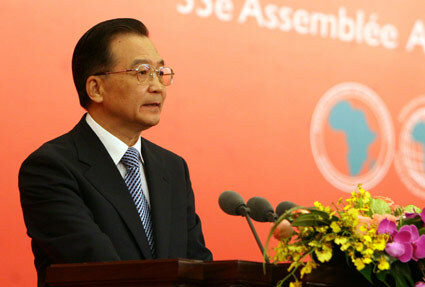 China's overall economic outlook was positive, Wen said Wednesday at the opening of the African Development Bank's annual meeting in Shanghai. He also promised that Beijing would make interest rates more flexible while using all available options to control growth of its money supply and ensure economic stability. That could indicate tightening measures may be on the way to cool an economy that grew a blistering 11.1 percent in the first quarter -- growth that authorities worry could lead to a debt crisis or higher inflation. "There are some problems. We face excessive liquidity, an imbalance in the balance of payments, and rapid accumulation of foreign exchange. But we are taking measures to deal with these issues," Wen said. "We are fully confident and capable of resolving the problems and maintaining sustained, stable and sound growth of the financial sector," he said. China's bulging global trade surplus, which last year grew to US$177.5 billion, and currency regime are expected to among the top issues discussed at a meeting of top Chinese and US trade officials next week in Washington. Wen reiterated Beijing's vow to let markets play a greater role in setting the yuan's value, which critics say is artificially low, giving Chinese exporters an unfair advantage. "We are deepening reform of the foreign exchange management system to improve the mechanism of setting the (yuan) exchange rate and give greater scope to the role of the market and introduce greater interest rate flexibility," Wen said, without giving details. Beijing has defended its currency policies, and on Tuesday, a senior Chinese finance ministry official warned that pressuring China to speed up currency flexibility will "backfire." China ended a decade-old direct link between the yuan and the US dollar in July 2005, and revalued the currency by 2.1 percent. Since then, the yuan has risen a further 5.3 percent against the dollar. Despite criticism from the US in particular, Chinese officials contend that reforms are moving as quickly as the developing economy and financial system will allow. Beijing, meanwhile, is concerned that cash from its trade surplus is feeding too rapid credit and investment growth, which could result in excess production capacity. Stock prices are also soaring, fanning worries that a bubble might be forming in the market. To cool growth, authorities have raised interest rates three times within the last year, imposed investment curbs on real estate and repeatedly hiked the reserve ratio for banks. The country's foreign reserves, the world's largest, have surged past US$1.2 trillion, and Beijing says it plans to create a multibillion-dollar company to invest some of the stockpile. China, one of 24 non-African shareholders in the African Development Bank, is hosting the bank's meeting for the first time, in a symbol of its growing economic ties with the continent. An estimated 700-800 Chinese companies are active in Africa, sending two-way trade soaring to US$55.5 billion last year, four times its 2000 level, according to the bank. Beijing says it wants to that figure to rise to US$100 billion by 2020.